The Union Minister of State (Independent Charge) of the Ministry of Development of Northeastern Region (DoNER), MoS PMO, Personnel, Public Grievances, Pensions, Atomic Energy and Space, Dr. Jitendra Singh has announced the setting up of "Center for Brahmaputra studies" in the university and said, he dreams of the day when students and scholars from far and wide would come all the way to Guwahati in pursuit of specialised learning and research. 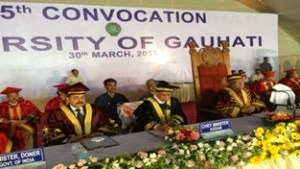 He was addressing the 25th convocation of Guwahati University, in Guwahati today. Dr. Jitendra Singh complimented the brilliance and diligence of the scholars from this part of the country that after overcoming the constraints of inaccessibility and distance, some of them are today leaders in academic and scientific research in their respective fields. Citing Prime Minister, Shri Narendra Modi’s vision for Northeast, Dr. Jitendra Singh said, the years to come may witness the region developing as an organic capital of India and when that stage is achieved, we will find scholars from far and wide coming to Northeast for research in organic science, organic flora and organic growth. In this context, he also referred to the work undertaken by DoNER Ministry as a follow-up to Prime Minister’s announcement for setting up six Agricultural colleges in the region and Rs.100 crore allocated exclusively for organic farming in the year 2014-15. Referring to some of the recent initiatives of DoNER Ministry, he spoke of “Ishaan Uday” - special scholarship scheme for students of the region and “Ishaan Vikas” - a scheme to provide apprenticeship facility to students of the region in IITs, NIITs and NIFTs of other parts of the country. In this regard, he assured that DoNER Ministry will make every possible effort for comfortable and safe hostel accommodation for such students in other cities of India. Dr. Jitendra Singh called upon the Vice Chancellor and the senior faculty members to prepare a list of potential students capable of pursuing specialist course or higher studies and the DoNER Ministry will try to facilitate their entry into such universities. However, he appealed to the students that after pursuing their higher studies in leading universities in other parts of the country, they should come back to their respective States. Expressing concern over the exodus of students and youth in search of jobs and higher studies outside Northeast, Dr. Jitendra Singh said, he proposes to work in close tandem with the HRD Ministry and requested to depute renowned faculty for universities in the Northeast by providing them extra incentives and perks. Similarly, he said, he has a plan to arrange Job Fairs and campus interviews by renowned Multi National Companies in the capital cities of eight States because this experiment he had even tried in his own constituency and the results were amazingly encouraging as more and more youth found employment at their doorstep and also placement in their respective native zones. As a DoNER Minister, Dr. Jitendra Singh said, he would try to work out the feasibility of student exchange programmes with some of the leading foreign universities and referred to his meeting with the Vice Chancellor of Cambridge University who also happens to be a medical professional. The Governor Assam, Shri P.B. Acharya and the Chief Minister of Assam, Shri Tarun Gagoi are also present on the occasion. The Telecom Regulatory Authority of India (TRAI) today issued the “Consultation Paper on Regulatory Framework for Over-the-top (OTT) services” seeking comments of all stakeholders. Telecom service providers (TSPs) offering fixed and mobile telephony are currently being overwhelmed by online content, known as over-the-top (OTT) applications and services. The term over-the-top (OTT) refers to applications and services which are accessible over the internet and ride on operators’ networks offering internet access services e.g. social networks, search engines, amateur video aggregation sites etc. OTT providers make use of the TSPs’ infrastructure to reach their customers and offer products/services that not only make money for them but also compete with the traditional services offered by TSPs. Leave aside TSPs, these apps also compete with brick and mortar rivals e.g. e-commerce sites, banking etc. Today, users can directly access these applications online from any place, at any time, using a variety of internet connected consumer devices. The rising penetration of smartphones (because of declining price) and the up-gradation of access networks by the TSPs are among the important factors contributing to OTT growth. Digitalization of content has reduced conservation, reproduction and distribution costs, which, in turn, has promoted the explosive growth in the supply of online content. Paradoxically, the broadband networks provided by incumbent TSPs are used as a platform by the OTT players for the development of new businesses. The growth of traffic apart, the OTT applications have created an increasing demand for faster broadband speed, which translates into a need for huge investments in network up-gradation by the TSPs. Worldwide there is an ongoing debate amongst Governments, industry and consumers regarding the regulation of OTT services and about net-neutrality. In this background, TRAI has today released a Consultation Paper on Regulatory Framework for Over-the-top (OTT) services. This Consultation Paper covers the views of the service providers and OTT providers, all related issues (including network neutrality), international experience with network neutrality and regulation of OTTs (communications and non-communications). Written comments on the Consultation Paper are invited from the stakeholders by 24th April, 2015 and counter comments by 8thMay, 2015. The comments may be sent, preferably in electronic form, to Mr. A. Robert J. Ravi, Advisor (QOS) on the e-mail addressadvqos@trai.gov.in. The comments can also be faxed to 011-23213036. All comments will be posted on the TRAI’s website. For any further clarifications please contact Mr. A. Robert J. Ravi , Advisor (QOS) on 011-23230404. The Minister of State for Culture (Independent Charge), Tourism (Independent Charge) and Civil Aviation, Dr. Mahesh Sharma has extended his greetings to the eminent personalities who have been conferred with Padma awards in the field of art, at a Civil Investiture Ceremony held at Rashtrapati Bhavan today. He has congratulated them for their efforts and contribution in the promotion of art and culture. Dr Mahesh Sharma has conveyed his best wishes to the awardees and their families. India’s leading vocalist of Carnatic music, Smt Sudha Rangunathan has been conferred with Padma Bhushan .The world renowned Indian film Director , Shri Sanjay Leela Bhansali, poet-writer-lyricist and internationally acclaimed communication leader, Shri Prasoon Joshi and cultural icon and music legend of Odisha, Shri Prafulla Kar have been awarded with the Padma Shri. Similarly, pioneer in the field of professional wildlife and conservation film making in India, Shri Naresh Bedi, world’s leading expert of traditional textile arts of India, Shri Rahul Jain and Ms Kanyakumari Avasarala, a top ranking Carnatic violinist and top rank artist of All India are also among the recipients of Padma Shri for their contribution to the field of art. The Minister has also greeted the personalities who have been presented Bharat Ratna, Padma Vibhushan, Padma Bhushan and Padma Shri awards today and greatly appreciated their contribution to the society. 1. The Defence Minister of India Manohar Parrikar is paying a bilateral visit to Japan from 29 March to 1 April, 2015 at the invitation of the Minister of Defence of Japan, Gen Nakatani. The two Ministers held a Defence Ministerial Meeting on March 30, 2015 in Tokyo. 2. The meeting was held in a constructive, friendly and forward looking atmosphere. The two Ministers briefed each other on the security environment surrounding each country and their respective defence policies. They reviewed strategic developments relating to international security situation with emphasis on the inter-connected Asia-Pacific and Indian Ocean regions. They were of the view that in the inter-connected Indo-Pacific region, India-Japan Special Strategic and Global Partnership has a key role in maintaining peace and stability in the region. Minister Nakatani briefed on Japan’s recent efforts related to Japan’s security policy. Minister Parrikar appreciated the detailed briefing. 3. The two Ministers welcomed the progress made in bilateral defence exchanges following the signing of Memorandum of Cooperation and Exchanges in the Field of Defence during the visit of Prime Minister Narendra Modi to Japan in September 2014 and emphasized the need to further strengthen and elevate bilateral defence relations. They appreciated on-going maritime cooperation as exemplified by bilateral Japan-India Maritime Exercises and participation of Japan Maritime Self Defence Force in India-US Joint Naval Exercises “Malabar 14” in July 2014, which was held off the coast of Japan. 4. The two Defence Ministers noted the progress made in discussion in the Joint Working Group (JWG) on Defence Equipment and Technology Cooperation (JWG-DETC). They were of the view that India and Japan have the potential in the area of defence equipment and technology cooperation, which can emerge as a key pillar of bilateral defence relations. They exchanged views on potential projects for cooperation in this area and emphasized the need to pursue mutually beneficial future cooperation projects. a) The Defence Minister of Japan will visit India in 2016.
b) Hold the 4th Vice-Minister/Defence Secretary level Defence Policy Dialogue and the 3rd Vice-Minister/Secretary level“2 plus 2” dialogue in Delhi at the beginning of April, 2015.
c) Visits by Service Chiefs on reciprocal basis. Minister Parrikar thanked Minister Nakatani for the gracious welcome and hospitality extended to him and members of the Indian delegation during his visit to Japan. In an impressive ceremonial parade held at the Naval base today, Vice Admiral Sunil Lanba, PVSM, AVSM, took over charge as the Flag Officer Commanding-in-Chief of the Southern Naval Command from Vice Admiral SPS Cheema PVSM, AVSM, NM. The Parade was followed by the traditional ‘Pulling Out’ Ceremony in which the outgoing Commander-in-Chief, Vice Admiral SPS Cheema was ceremonially pulled out in a jeep by Flag Officers and Commanding Officers of Ships and Naval establishments of Kochi, amidst emotional ‘Jai’- ‘Jai’ by the men of Southern Naval Command. Earlier in the day, Vice Admiral Lanba laid wreath at the War Memorial, prior to assuming command, as a tribute to the thousands of martyrs who had fought for the country. The Flag Officer, a native of Palwal in Haryana, who was the Vice Chief of Naval Staff prior to taking over as the FOC-in-C (South), had arrived in Kochi on 28 Mar15. In his farewell address Vice Admiral Cheema praised every member of the Southern Naval Command for their all round contribution. He expressed sincere gratitude to all for the unstinted support. He reminded everyone that, the SNC being a training Command, needs to continuously be on task be it peace or war. He urged everyone to extend the same support to Vice Admiral Sunil Lanba whom he termed as a visionary leader with head and heart. Vice Admiral SPS Cheema PVSM, AVSM, NM will now assume the charge of the Flag Officer Commanding in Chief, Western Naval Command on 31 Mar 15 on the retirement of the present incumbent, Vice Admiral Anil Kumar Chopra. The Union Minister of Science & Technology and Earth Sciences, Dr. Harsh Vardhan has said that India can now boast of being one of the most scientifically advanced countries to tackle any situation effectively arising out of natural calamities and disasters. Inaugurating the Multi-Parametric Geophysical Observatory set up by the Indian Institute of Geomagnetism at Shoal Bay No. 8 in Port Balair on Andama & Nicobar Islands this evening, the Minister attributed this to the invaluable contributions made by our scientists who, he said, continue to make relentless efforts for their scientific innovations for the development of the country. Lt Governor, Lt Gen. AK Singh (Retd), Member of Parliament, Shri Bishnu Pada Ray, Chief Secretary, Shri Anand Prakash, and senior officers from the A&N Administration, were among those present on the occassion. Dr. Harsha Vardhan further referring to the December 2004 Tsunami disaster which shook the entire Nation, said that Tsunami was new to all of us and our country was not at all prepared to tackle this natural occurrence. However, after that tragedy, our scientists joined together and we are now well equipped with early warning systems to tackle any eventualities due to disaster like earthquake etc. Dr. Harsh Vardhan said, India is much ahead in terms of Early Warning Systems and this is evident from the fact that about 28 nations depend and act upon the real time data provided by India, which, he said, is a matter of great pride for all of us. The Minister, who himself is a physician, also noted with appreciation that the Medical College project for A&N Islands which was sanctioned during his tenure as the Health Minister, is moving in the right direction and it will fulfill the long pending demand of the people of these Islands. He also acknowledged the painstaking effort made by the Lt Governor, the Member of Parliament and the local leadership for regularly meeting him in Delhi to get the Medical College project sanctioned. Dr. Harsha Vardhan said it was his dream from childhood to visit these islands which was fulfilled today. He highlighted the contribution of Veer Savarkar in the freedom struggle who was incarcerated in the Cellular Jail. Dr. Harsha Vardhan opined that A&N Islands is a place of pilgrimage where the freedom fighters have made supreme sacrifices in the cause of the motherland. “If there is a sacred place in the country it is Andamans where the National Memorial Cellular Jail is a testimony to the great suffering of the freedom fighters”, he added. In his address on the occasion, the Lt. Governor appreciated the move made by the Indian Institute of Geomagnetism (IIG) for setting up of the Geophysical Observatory here in the Islands, considering that these Islands lie in Seismic Zone 5 and that the setting up of such Laboratory is going to be immensely beneficial to the Islands. The Lt. Governor also lauded the efforts of the Indian National Centre for Ocean Information Science (INCOIS), Hyderabad for their frequent updates and early warnings on natural disaster such as earthquake, cyclones etc. The Lt. Governor also urged the Union Minister to help the Island Administration to set up a Desalination Plant at Mayabunder or Chowra on a pilot project basis in order to overcome water scarcity in these places. He also requested for setting up of Biotechnology Research Centre and said the Administration is ready to extend help, if needed, in this regard. In brief address on the occasion, the Member of Parliament, Shri Bishnu Pada Ray expressed his happiness that a useful asset has been created in the Islands. Earlier, in his welcome address, the Chairman, Governing Council, IIG, Dr. V.P. Dimri said altogether 14 Geophysical Observatories including the one at Shoal Bay No.8 are functioning under Indian Institute of Geomagnetism (IIG) in the country for mitigating natural disaster of varied origins. He said the Geophysical Observatories are placed in different parts of the country and the country has taken a big leap in the field of Science and Technology over the past few years. The Union Home Minister, Shri Rajnath Singh has telephonically discussed with the Chief Minister of Jammu and Kashmir the flood-like situation in the state due to increasing water levels in Jhelum River at Srinagar. He assured full central assistance to tackle the situation. A meeting of the National Crisis Management Committee (NCMC) was held here today under the chairmanship of Cabinet Secretary, Shri Ajit Seth to take stock of the flood like situation in Jammu & Kashmir and to review the arrangements made or required to be made to deal with the situation. The meeting was attended by the Secretaries/Sr. Officers of the relevant departments of the Government of India. The Chief Secretary, J&K and other officers of the State Government participated through Video Conferencing. The Chief Secretary gave a brief account of the ground situation indicating that river Jhelum is flowing above danger mark at certain places and as a result, flood alert has been issued by the State Govt. He remarked that State Govt. is geared up to deal with the situation and all the steps have been taken to safeguard life and property from the flood waters. They have adequate sand bags and river bank reinforcement material. As a precautionary measure adequate quantities of rice, potable water and medical supplies are being stocked at various locations. There is no shortage of various types of fuel as there is a minimum stock level of all varieties of fuel for 10 days. The Chief Secretary, J&K Govt. about the additional requirement of rescue boats and depumping sets. The National Highway 1-A between Jammu and Srinagar which is blocked due to landslide is likely to be cleared for vehicular traffic today itself. The Cabinet Secretary reviewed the preparatory arrangements made to handle the flood situation in J&K and issued necessary directions to all departments of the Govt. of India to provide all possible assistance to tide over the crisis. The Ministry of Home Affairs is also in touch with the state government officials and closely monitoring the situation. No breach of embankment has been reported. However, as a precautionary measure, to assist the state government authorities, eight teams (approx 400 personnel) of National Disaster Response Force have been deputed. The state government has been asked to indicate the assistance required by them. A meeting of the National Crisis Management Committee (NCMC) was held today under the chairmanship of Cabinet Secretary, Shri Ajit Seth to take stock of the flood like situation in Jammu & Kashmir and to review the arrangements made or required to be made to deal with the situation. The meeting was attended by the Secretaries/Sr. Officers of the relevant departments of the Government of India. The Chief Secretary, J&K and other officers of the State Government participated through Video Conferencing. The National Highway 1-A between Jammu and Srinagar which is blocked due to landslide is likely to be cleared for vehicular traffic today itself. On the request of the State Govt., National Disaster Response Force is dispatching 8 Teams (approx 400 personnel) alongwith rescue boats and water pumps to Srinagar to take part in relief operations. The Cabinet Secretary reviewed the preparatory arrangements made to handle the flood situation in J&K and issued necessary directions to all departments of the Govt. of India to provide all possible assistance to tide over the crisis.